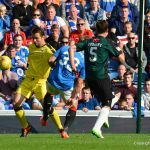 Raith Rovers were unable to lay a glove on a rampant Rangers side this afternoon, as the Ibrox side made it nine wins from nine this season, with a dominant 5-0 win. 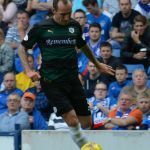 Rovers boss Ray McKinnon made one change from last weekend’s 2-0 defeat to Hibernian at Easter Road, with right-back David Bates dropping to the bench, as Jason Thomson returned after serving his suspension. 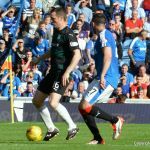 While the initial line-up suggested a 4-4-2 system, it quickly became apparent that it was in-fact a 4-4-1-1, with Mark Stewart assigned a wide-left berth, and James Craigen playing as a withdrawn forward behind Jon Daly. The opening seconds started in an encouraging fashion. Grant Anderson made an interception wide on the right and advanced forward, picking out Craigen with a pass, who in turn, aimed a cross to the back-post to Stewart, and while the forward would have been hard pushed to nudge the ball into the net from such a narrow angle, his attempt was blocked for a corner kick. 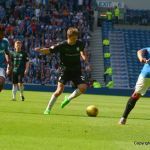 The set-piece amounted to little, although it was the first of two in the opening moments, illustrating that Raith’s game-plan was to try to take advantage of Rangers overloading their starting XI with an abundance of attack-minded personnel. 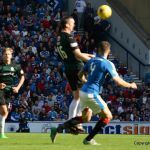 However, a recurring theme over the last few league meetings between these two clubs, has been the concession of an early goal from Raith, and this match followed the same routine. 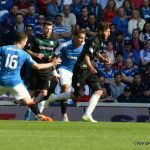 James Tavernier has been much talked about this season, and it was his run down Rangers right which was halted by Mark Stewart, who tripped the full-back in the third minute on the right-angle of the Raith box. 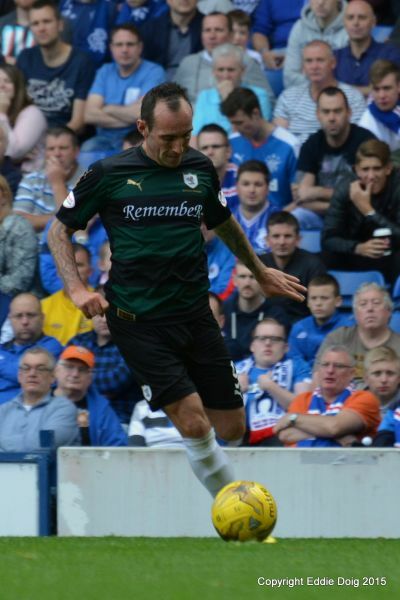 With most expecting a shot at goal, the ball was instead worked across the length of the Rovers penalty area, for Lee Wallace to curl a finish into the left-hand side of Kevin Cuthbert’s net to open the scoring, generating a sinking feeling amongst the Raith support gathered in the corner of the stadium. 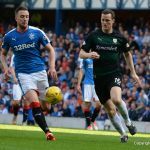 With Rangers taking an early grip on the game, Rovers were already up against it, and as they’ve shown numerous times already this season, Mark Warburton’s team looked eager to ratchet up a big scoreline. Lewis Toshney had to put this body on the line to block a Gedion Zelalem shot on the edge of the area, and the Rangers midfielder, on-loan from Arsenal, was a key man in the game’s embryonic stages, looking for the ball at every opportunity, which, when you’re blessed with as much skill as he has, is fairly unsurprising. 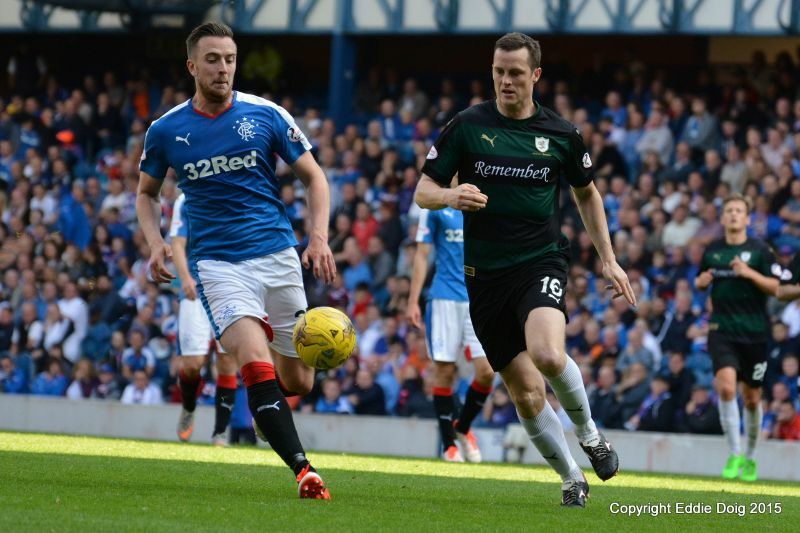 He was the hub of Rangers next move, taking the ball deep from the Robert Kiernan, before careering forward, nonchalantly side-stepping Kyle Benedictus, before releasing Martyn Waghorn with a clever pass. 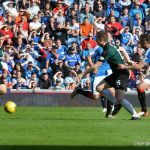 However, although the forward had assumed a similar position from where Wallace had plucked the opener, the striker couldn’t reproduce the left-back’s finish, as he whipped his finish well wide of the target. Toshney then had to make an excellent tackle on Waghorn on the edge of the six-yard box as they threatened once more, and the centre-half did well a moment later, hooking a Zelalem shot off the line, after he’d placed it out of Cuthbert’s reach. 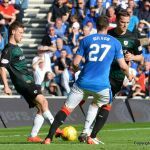 Rangers captain, Wallace almost doubled Rangers, and his own personal goal tally, after Barrie McKay had embarked on some excellent work down the left-wing, before pulling the ball back to his left-sided colleague. 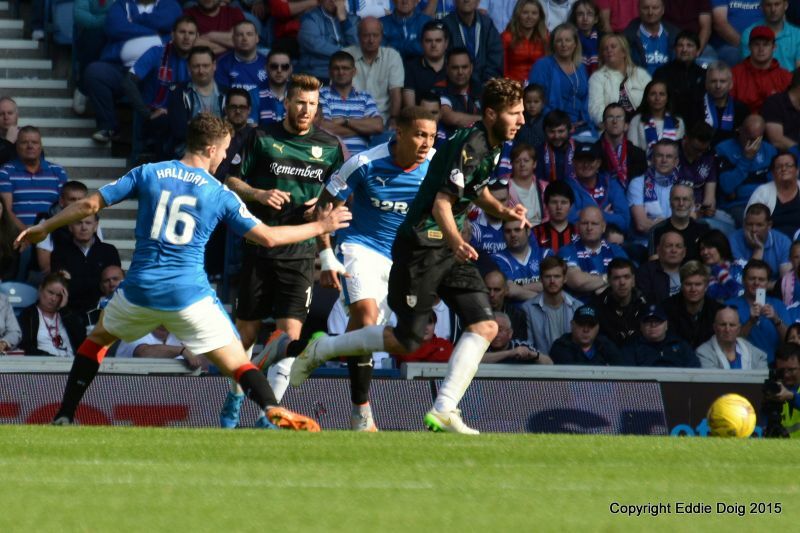 Lightning couldn’t strike twice on this occasion however, and Wallace pulled his shot wide of the far post. 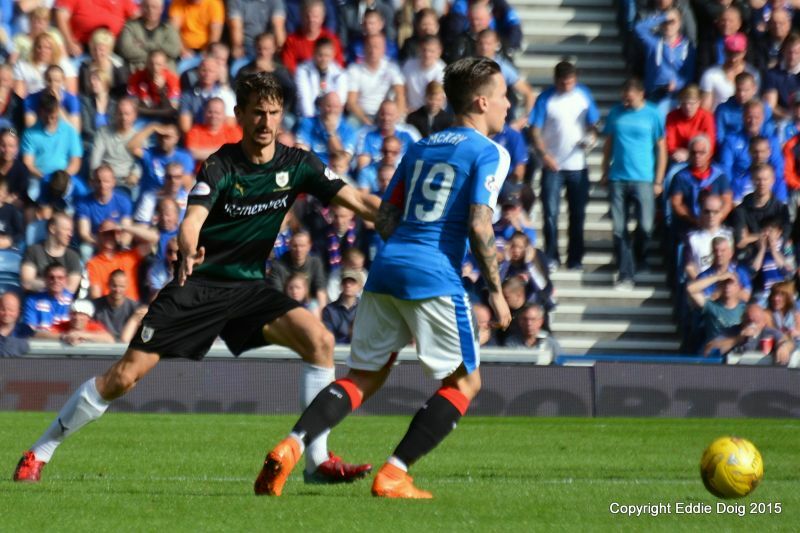 The same pair combined again, in what had now been a 30 minute exercise of defence versus attack, with McKay’s clever flick teeing up Wallace once more, but his shot was straight at Cuthbert. 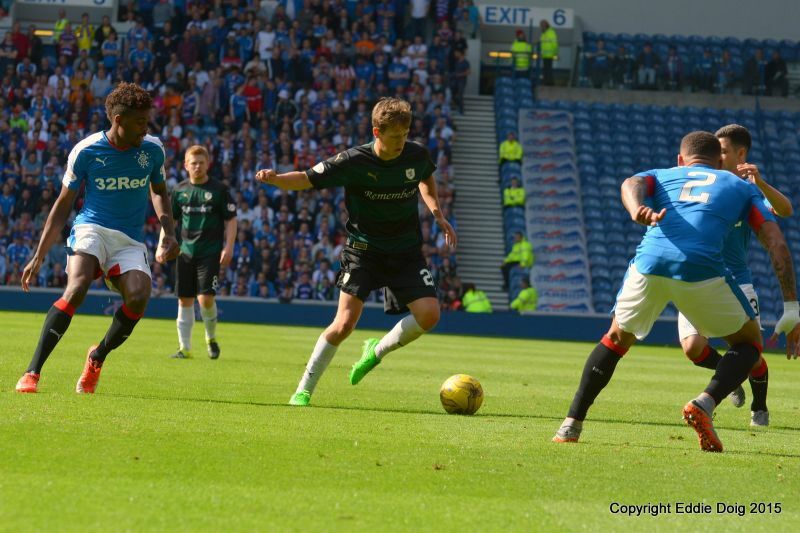 Nathan Oduwa hadn’t made quite as big an impression on the match as his fellow loanee, Zelalem, but he came to the fore with half-time approaching, showing excellent movement to cut inside and send a shot towards goal which Cuthbert stopped, before Thomson slid in to clear the ball, with Rangers players honing in to finish. 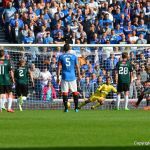 Despite Rangers utter dominance, it was starting to look as if Raith were going to go in at the interval just a goal behind, but that all changed in the final minute of the period. 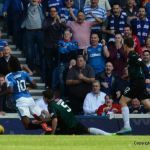 Oduwa managed to pick out the advancing Tavernier, and the defender dropped his shoulder and placed the ball past Cuthbert, clipping the inside of his right-hand post to make it 2-0. 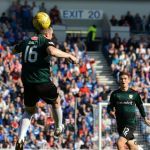 Raith may not have demonstrated a renewed sense of purpose in the second-half, but they did at least enjoy a modicum of possession in the early stages, with a spell of keep-ball between Ryan McCord, Stewart, and Rovers best outlet, Craigen. 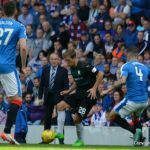 However, the spell was broken up before it could pose a danger to Rangers. 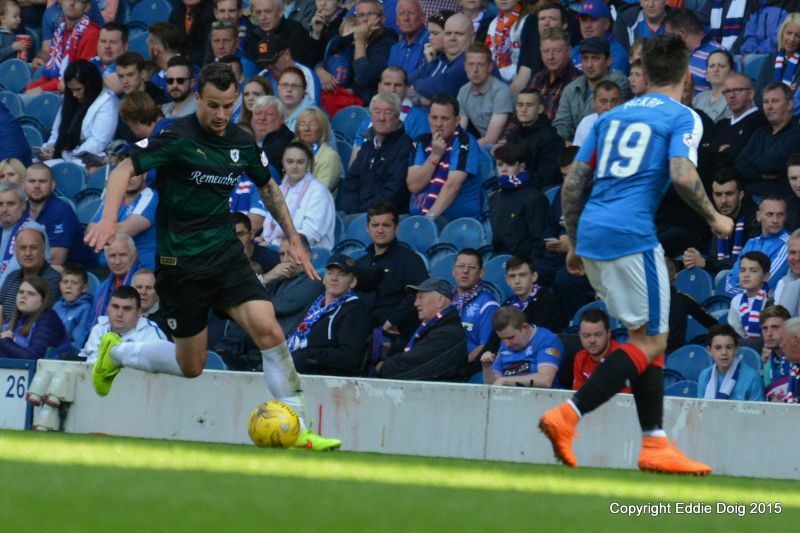 That said, Rovers almost reduced the arrears in the 50th minute, when Jon Daly nodded the ball into Craigen’s path, and his 25-yard half-volley was excellently tipped over the bar by Wes Foderingahm. 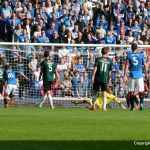 You could sense that the Rovers players were just starting to feel a little better about themselves, but those positive vibes were extinguished after 55 minutes, when Rangers extended their lead. It started with a Raith attack, Stewart had made good headway down the left, but with options in the middle, his cross was easily cut out, and suddenly Raith looked susceptible to the counter attack. 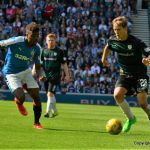 Oduha picked the ball up in the middle of the park, and showed incredible skill and presence of mind to outmanoeuvre Benedictus, Ryan McCord and Iain Davidson, before driving into the penalty area. 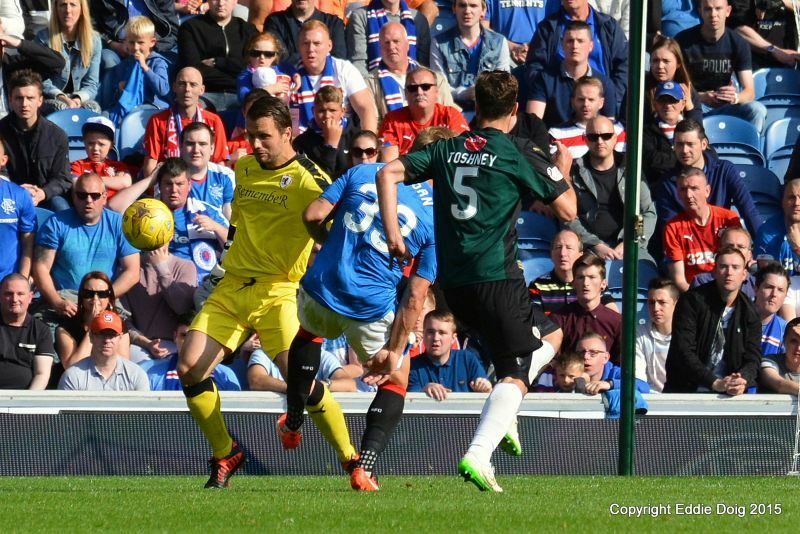 His pass across goal was deflected, but only into McKay’s path, who forced it over the line from close range. 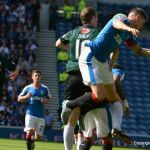 At this stage, the game had more-or-less become an exercise in damage limitation, but Rovers soon found themselves four down, when Waghorn’s advance into the area was stopped by Toshney, although not by fair means according to referee Brian Colvin. 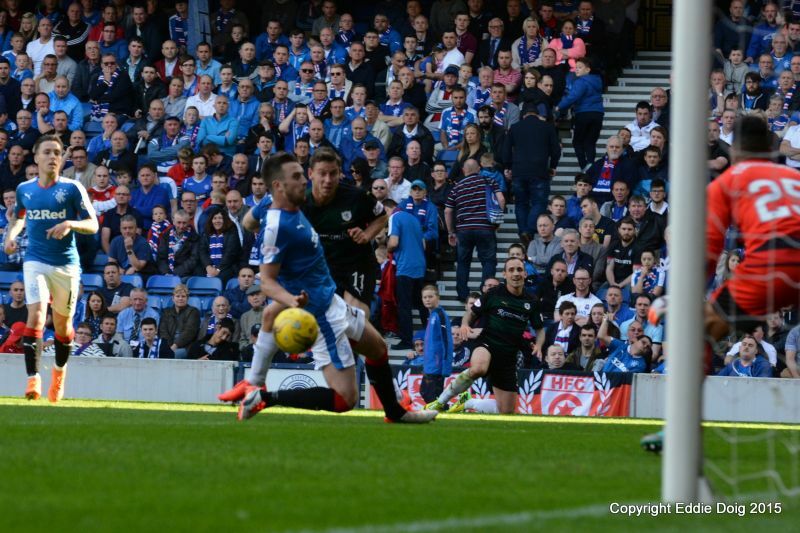 Waghorn took the kick himself, electing to send the ball to Cuthbert’s right, with the ‘keeper choosing to dive left. Again, Oduha was the architect, and while his first run which resulted in the third goal was impressive, his second burst into the box was bordering on the outrageous, only for him be stopped by a challenge from Toshney who clattered his legs from him in the penalty area, giving referee Colvin a simple decision. 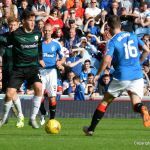 Waghorn and Cuthbert both decided to choose the same sides as they did the last time, for the exact same result. 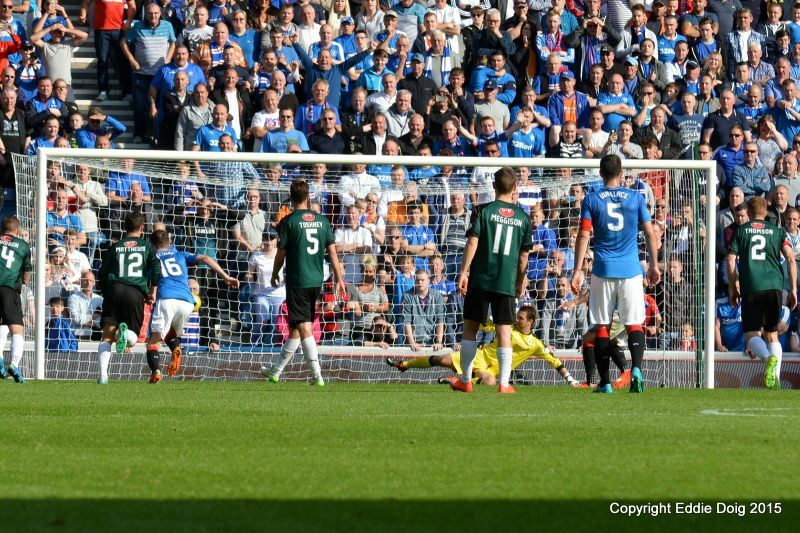 Perhaps the only surprise in the remainder of the match was that Rangers didn’t increase their lead yet further. Kiernan had a chance, sending a shot from distance straight at Cuthbert, while substitute Nicky Law should have made it six, but his shot from eight yards out, ended up careering over the bar, when it seemed a far simpler task to score. Megginson almost grabbed a consolation goal in the last few minutes, sending a shot from an angle just wide after some good set up play from Stewart. After two tough away matches, Raith return to Stark’s Park next Saturday, where they’ll face off against Queen of the South. Welcome to a sunny Ibrox, it's 16 degrees and only a slight breeze. David Bates drops to the bench to allow Jason Thomson back in the starting eleven after his suspension. 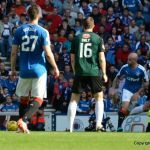 Messrs Holt and McKay in the Rangers side, both having had spells at Starks Park. Big Marvin is watching the game today, commentating for a radio station. 10 minutes from kick off and there are about 50 travelling supporters in their seats at the moment. Rovers take the field wearing the RemembeR strip. Raith kick off towards the Copeland Road end. Rovers come close with consecutive corners. 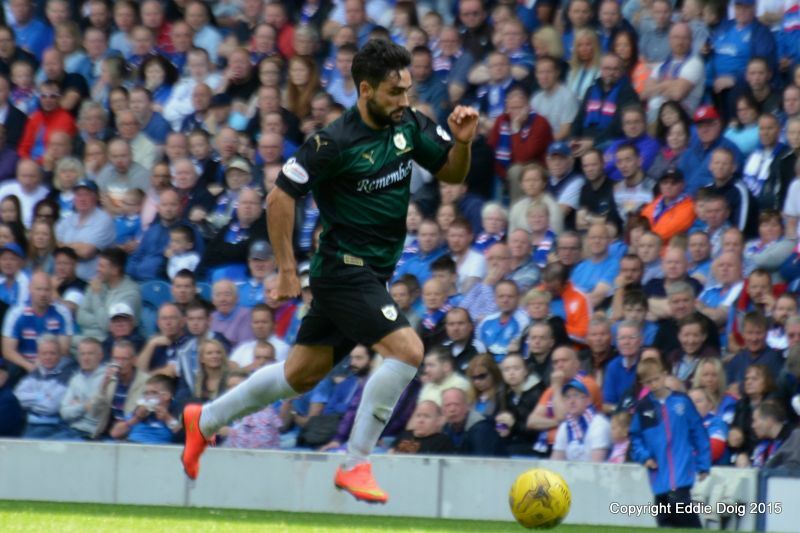 The ball bobbled about the box after a free kick and fell to Wallace who curled the ball past Cuthbert from 16 yards. Craigen and Stewart combined to find the line but the cross from the latter is cleared. 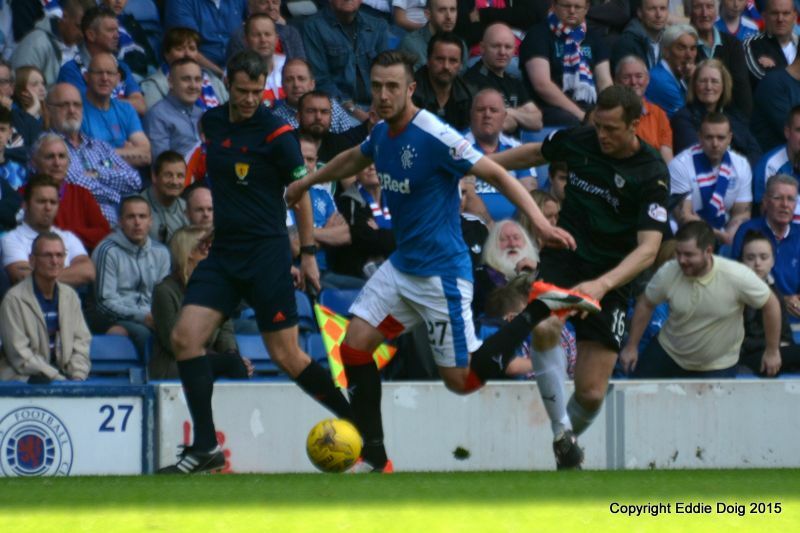 The ref has a word with Davo and Halliday. 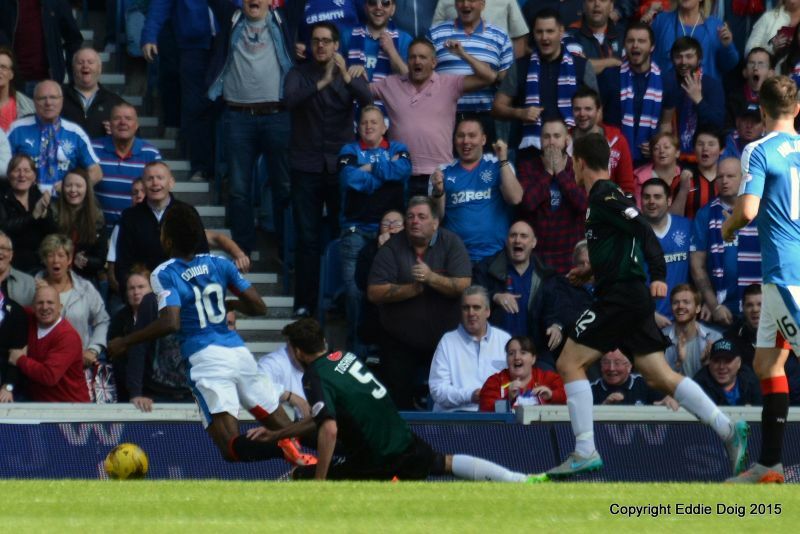 Tavernier is flattened having ran into Davo. Zelalem wins the ball from Toshney frees Waghorn who belts the ball the width of the box wide. 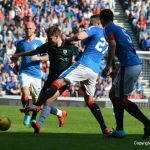 Stout defending from Toshney denies Tavernier. 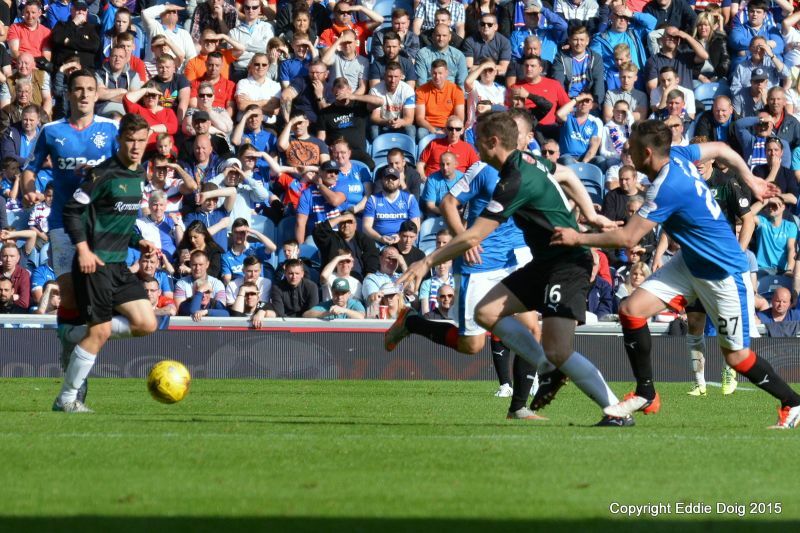 Stewart coming close with what was more of a cross than a shot. 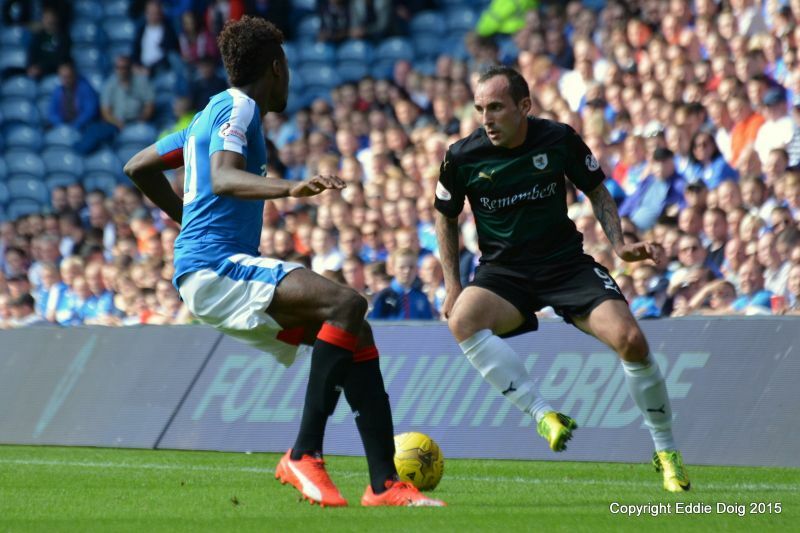 Oduwa opens his box of tricks to win a corner. Craigen breaks out only to be felled by Zelalem. 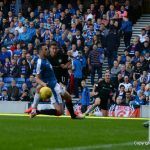 Tavernier pole axes a Rovers defender with a free kick. Anderson gets up and walks gingerly to the sideline. Play resumes with Anderson coming back to the field. Toshney reacts to a shot from Zelalem and instinctively clears off the line. 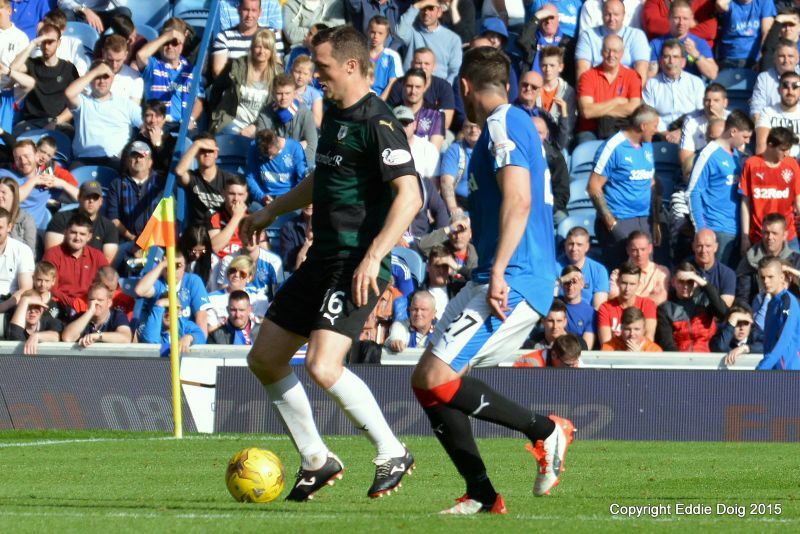 Holt and McKay combined the pass back fell to Wallace who curled the ball past the back post from outside the area. The play is mainly in the Rovers first third of the pitch at the moment. 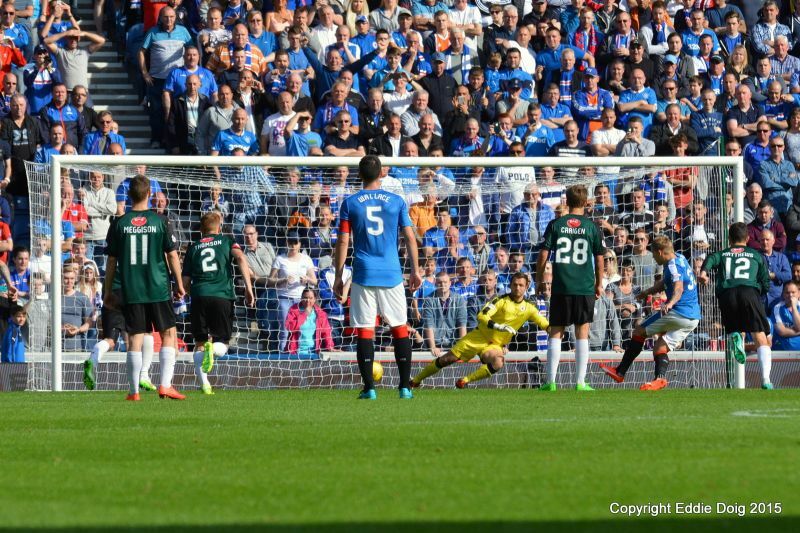 Halliday sends over a free kick which sails past a sea of rising bodies and out at the back post. 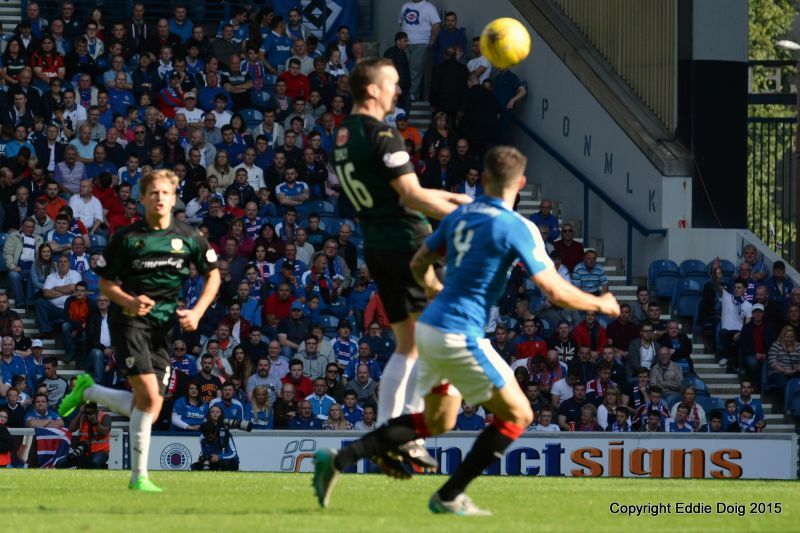 Waghorn with a header from 8 yards watched as Cuthbert easily held the ball. 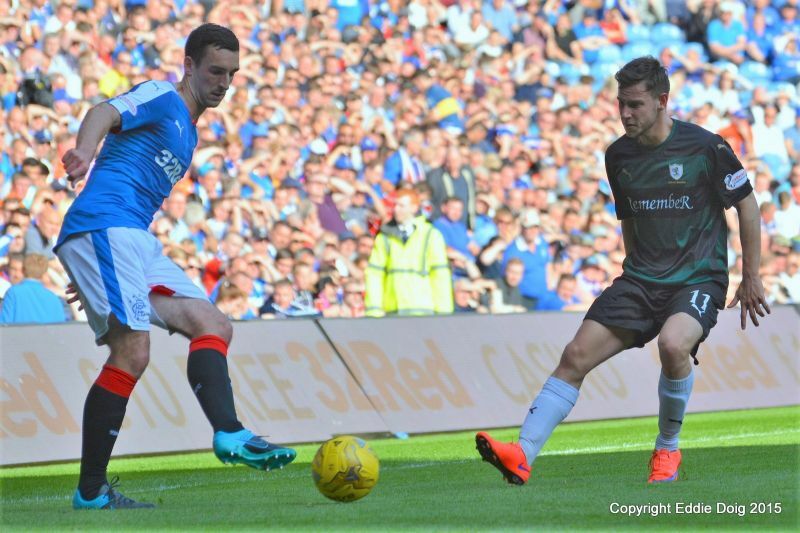 That man Wallace again with a curling shot from outside the box which Cuthbert held with ease. Oduwa strikes from 22 yards forcing Cuthbert to dive and parry , the ball cleared by Toshney. 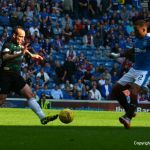 Tavernier strolls though the Rovers defence a shoots low past the diving Cuthbert. Oduwa making an early run in the box. 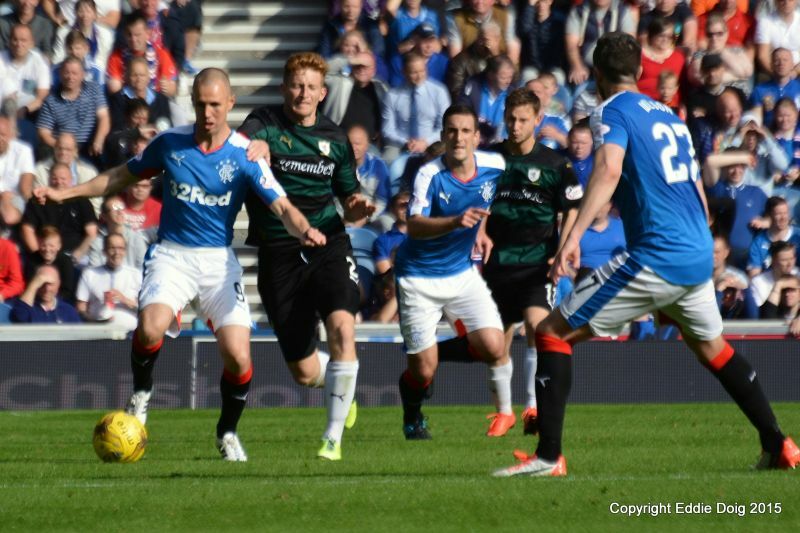 Anderson and Daly two on one with the keeper, Foderingham is quicker than both. 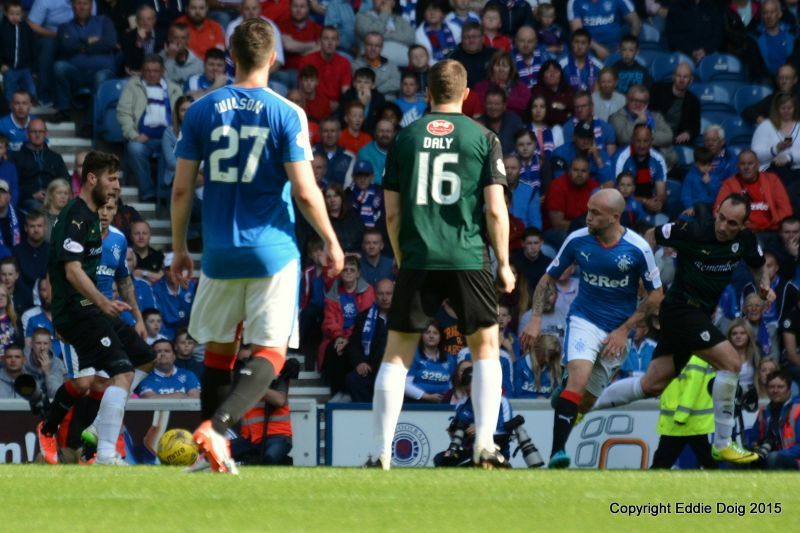 Daly shoots from 25 yards and is tipped over the bar by Foderingham. 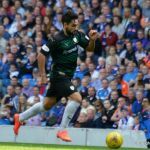 Cuthbert falls to his knees to collect a shot from McKay. Oduwa doing the work,crosses, Zelalem missed and the ball fell to McKay who shot home from 6 yards. 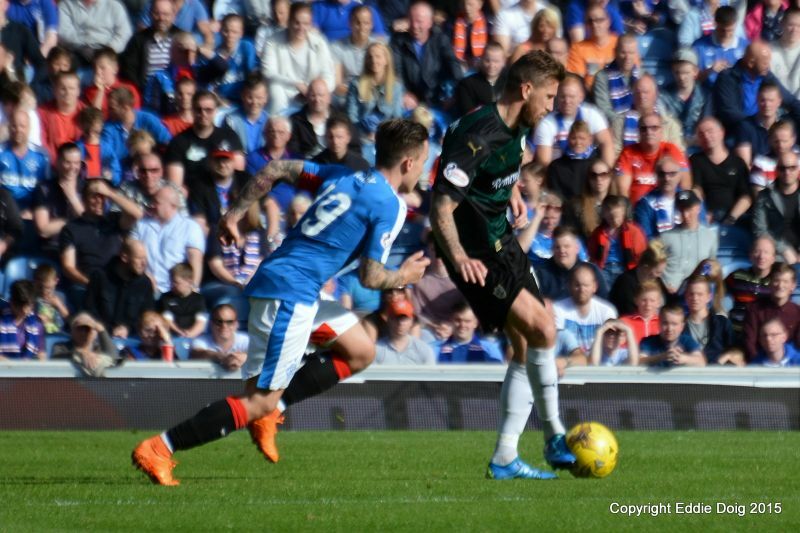 Waghorn yellow for a foul on Stewart. 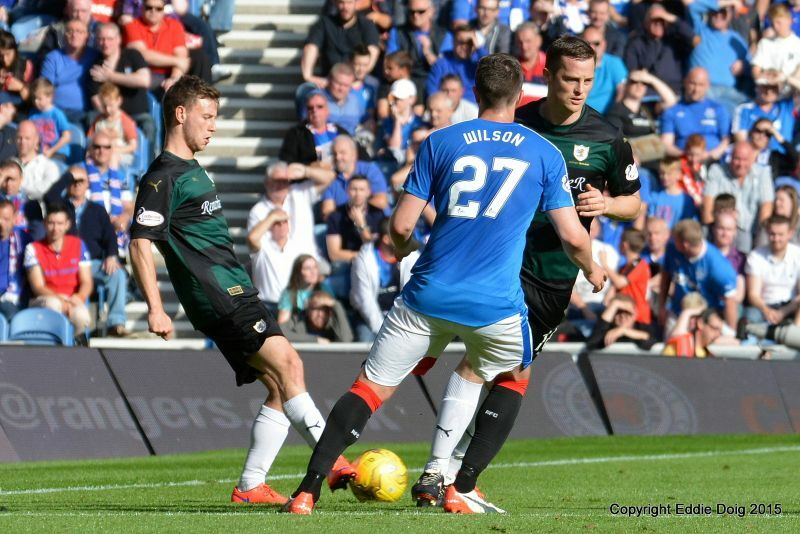 Thomson going unpunished for a challenge on Wilson. Holt and Zelalem off, Law and Miller on. 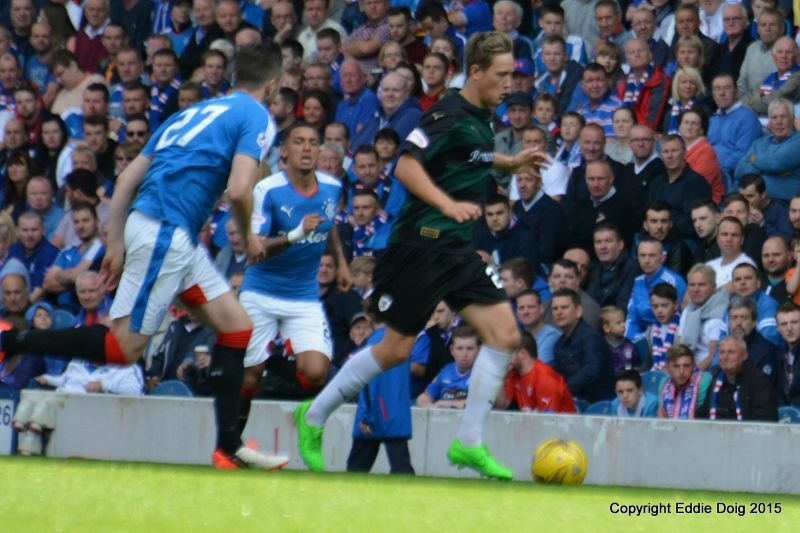 Waghorn wins a penalty , going to ground very easily. 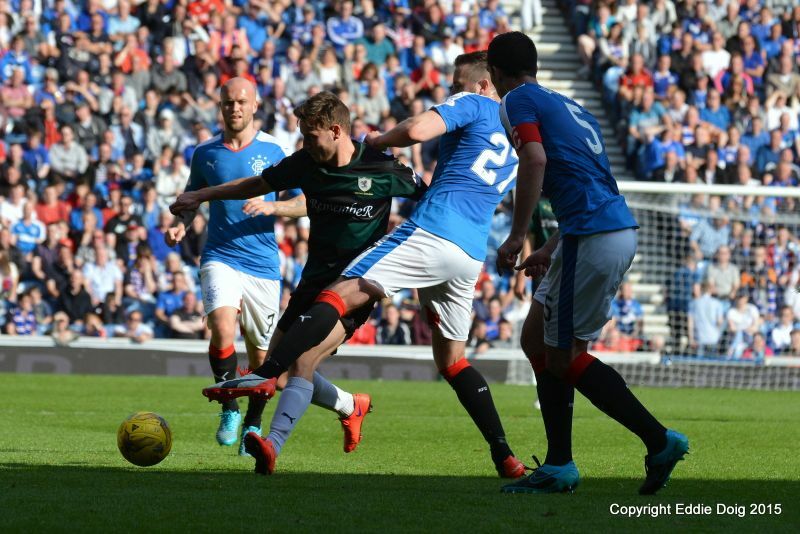 Goal Rangers, Waghorn shots low to Cuthbert's right. Oduwa meanders through the defence and is brought down by Toshney for a penalty. 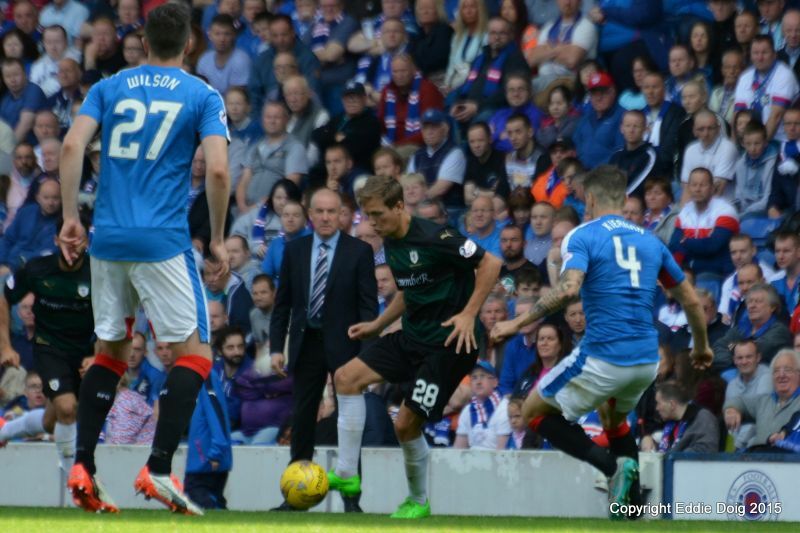 Goal Rangers, Waghorn with an identical shot as his first penalty. Toshney yellow for the penalty. 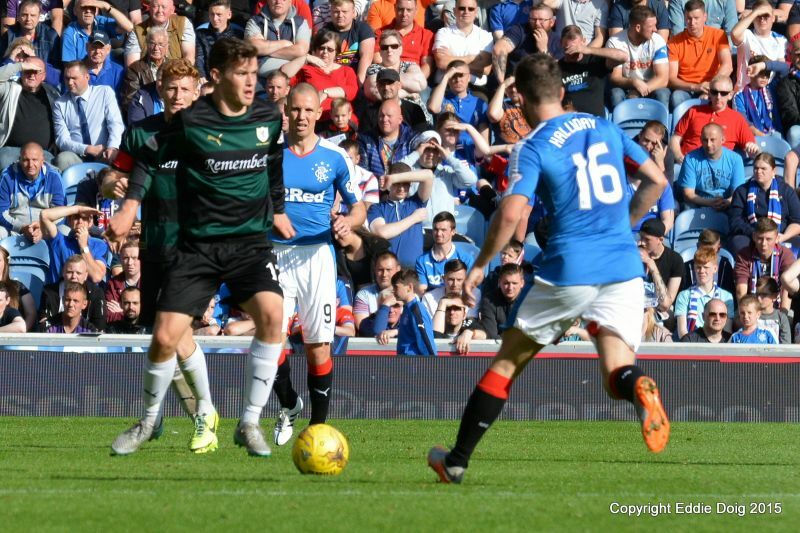 44 thousand at Ibrox today. 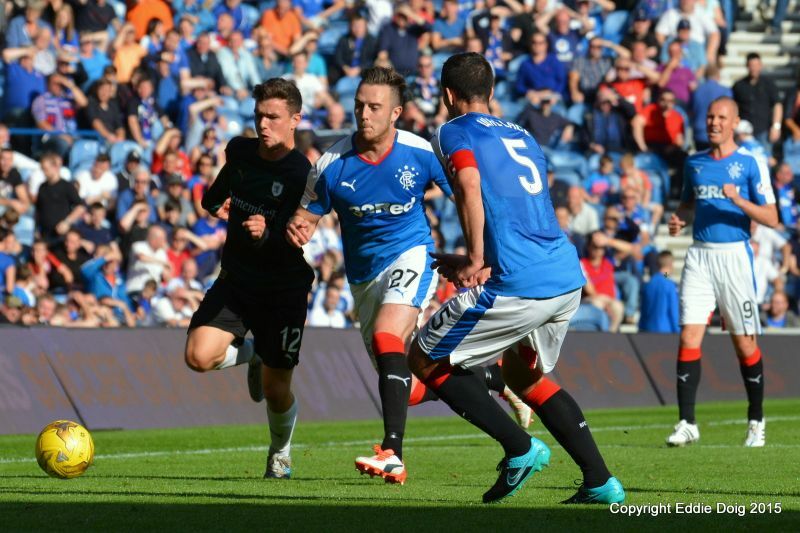 Halliday shoots from 35 yards, Cuthbert had plenty time to track the ball and held easily. 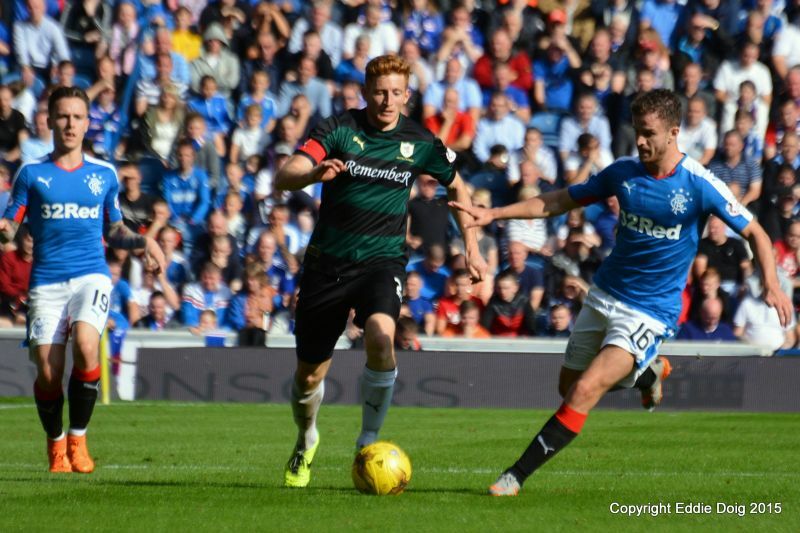 Cuthbert, this time collecting a cross from Tavernier. 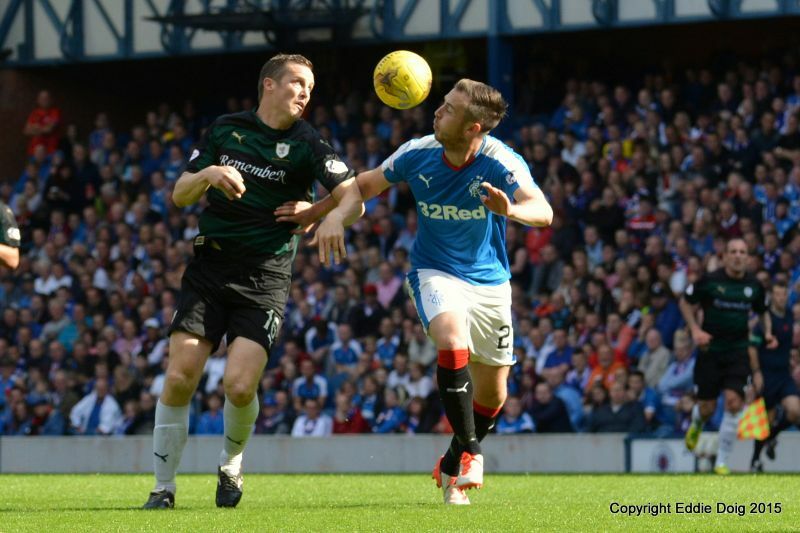 Rovers still trying to contain the Rangers attack who despite the score are still pressing. Stewart crosses to Megginson who fired the ball wide of the back post. Halliday with a pin point chip finds the head of Miller who heads the ball onto the roof of the net. 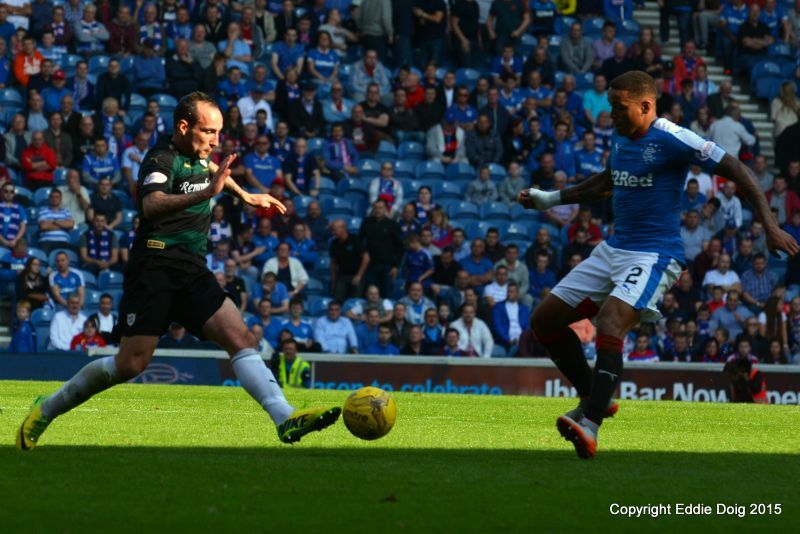 A shot from Miller cannons off Stewart for a corner. 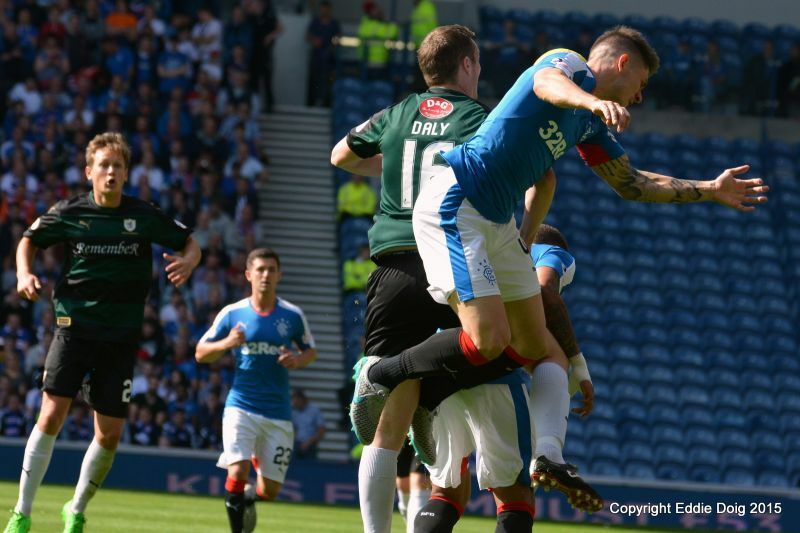 Waghorn is denied by the out rushing Cuthbert. +2 Law hooked the ball over the bar. Foderingham, Tavernier, Kiernan, Wallace, Zelalem, Oduwa, Halliday, McKay, Holt, Wilson, Waghorn. Subs, Kelly, Ball, Law, Miller, Aird, Hardie, Thompson. Subs, Laidlaw, Petrie, Megginson, Matthews, Bates, Ellis, Mackie. 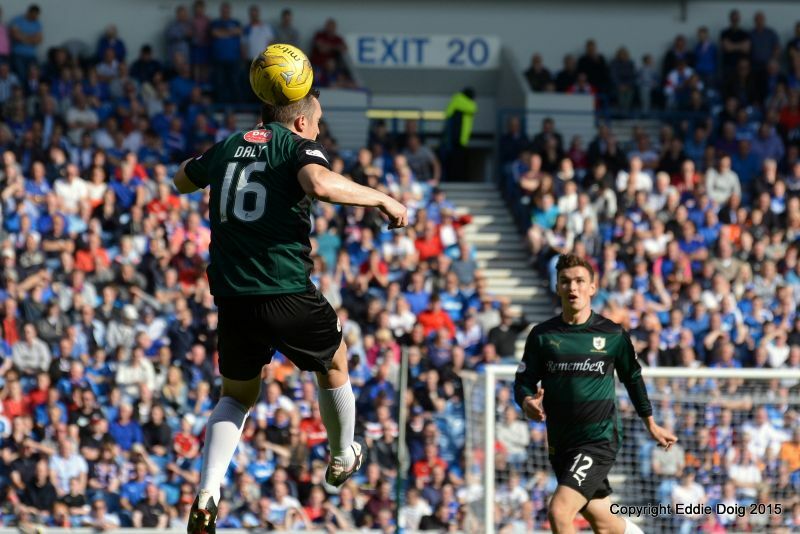 Raith Rovers head to Ibrox this weekend, looking to become the first club to defeat Rangers this season, with Mark Warburton’s side making a blistering start to their campaign. 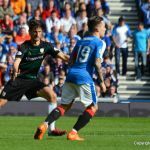 Sunday’s 5-1 win over Queen of the South was Rangers eighth consecutive win, and in the process, they’ve scored 30 goals, while conceding just five. Forward, Martyn Waghorn, their recent acquisition from Wigan Athletic, leads the way with six goals, but it’s another new signing from Wigan, full-back James Tavernier who has quickly established himself as the fans favourite. The defender’s forward forays have already produced five goals this term, and his electric bursts of pace and ability on the ball has made him a stand out since his arrival in the summer. 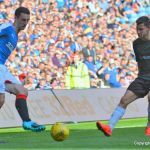 In midfield, Andy Halliday and Jason Holt have both settled in well since joining from Bradford City and Hearts respectively, but it’s a player who wore a Raith jersey last season whose perhaps made the biggest impact in the middle-of-the-park for the ‘Gers this term. 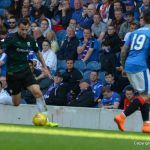 Barrie McKay’s man-of-the-match performance against the Doonhamers on Sunday, saw him produce two assists and a goal, but it was just the latest stand-out performance from a player who scored two goals in 25 appearances for Rovers last season. 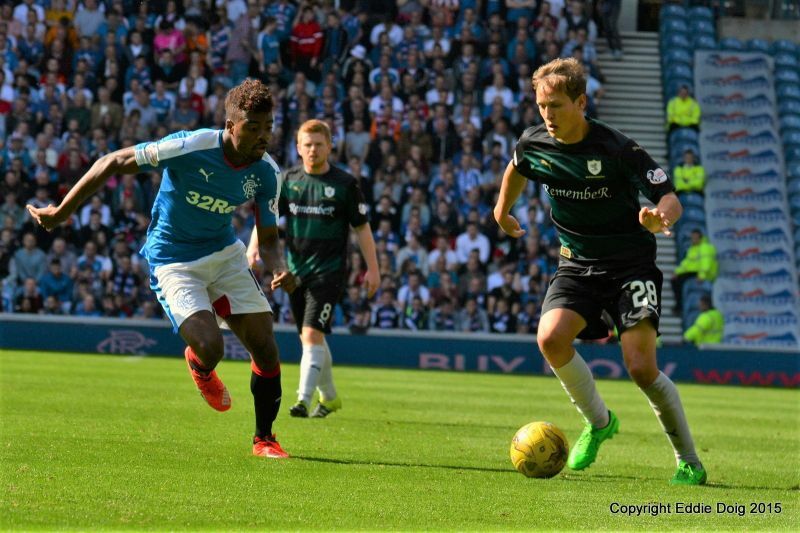 Ray McKinnon’s men can take hope from the fact Raith have registered a win over Saturday’s opponents in each of the last two seasons, with a 1-0 win in the Ramsdens Cup Final in 2014, and a 2-1 triumph in a fourth round Scottish Cup tie in February, their first win over Rangers at Ibrox since 1959. 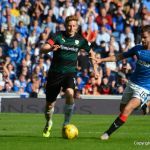 It was a different story during last season’s four Championship encounters however, with Rangers taking twelve points from twelve, in what were largely one-sided affairs. 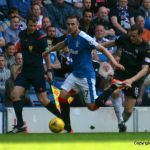 In the last ten meetings between the clubs, Raith Rovers have won twice and drawn once, compared to Rangers seven victories. Saturday afternoon’s match referee will be Brian Colvin.